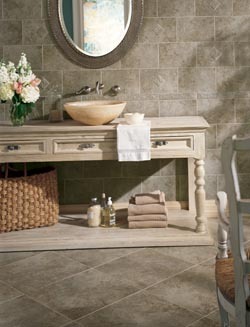 For a timeless, classic look that evokes memories of easier times, nothing beats tile flooring. Tile is a durable, beautiful flooring option that never goes out of style. The beauty of tile is only matched by its utility, perfect for kitchens and bathrooms thanks to its unparalleled ability to resist water and stains. When it comes to tile floor options, no one has a wider selection at a better price in the area than we do. We are here to give you a hand and make your next flooring project affordable and easy thanks to our wide selection of the best products and materials in the industry. We have it all, from porcelain, to ceramic, to glass tiles, suitable for any style. Tile is made in multiple materials, each one suitable to fulfill different needs. Our flooring showroom carries a huge selection of every type of tile you may need. Depending on your lifestyle, aesthetic preference, and budget, we help you to choose the best for your specific needs. We even offer expert tile flooring installation to ensure your investment is protected and will look great and last long. Ceramic tile is one of the most durable of our tile options. It is practical, timeless, and stylish. Perfect for kitchens due to its ability to resist stains and water, ceramic also holds up to any heavy kitchen appliances you may drop on it. Ceramic takes a beating and will last you for years down the line. Porcelain is a more refined style of tile flooring. With an elegant, almost stone-like appearance, porcelain is perfect for those who want a more refined look to their tile. Glass tiles are the go-to choice for many bathrooms in the area. Extremely water resistant, glass tile will protect your structure from water damage while still looking great. All of our collections of tile flooring are an excellent means of protecting your framework from moisture. It lasts for years, and keeps your home in the best condition possible. The quality of your new flooring installation is as important as the quality of the product you purchase. If the tile product you choose isn’t installed properly, it might have flaws that cost more in the near future. Our skilled installers have dealt with tile installations of every size and shape. Our professionals have the industry equipment necessary to do the job effectively and efficiently, and are sure to provide meticulous results. The best way to ensure that you get the maximum return on your investment is by seeking the aid of our experienced and skilled technicians to install your floors. A tile flooring installation by our team is affordable, fast, and reliable, ensuring that your tile flooring lasts for years to come. All of the installers we employ are fully certified and highly experienced, capable of getting in, getting the job done, and getting out before you even notice they’re there. Furthermore, they are dedicated to cleanliness, leaving no trace of their presence beyond the beautiful, perfectly installed tile floors they leave behind. Contact us today to find the tile floors that will suit your lifestyle needs. We are proud to serve Medina, Brunswick, Strongsville, Hinckley, and North Royalton, Ohio, and the surrounding area.